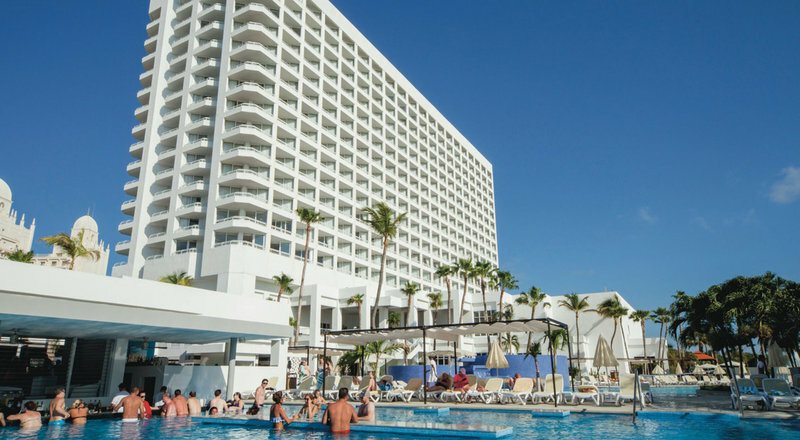 The Riu Palace Antillas Hotel, a 24h All Inclusive resort, is located on the shores of Palm Beach, Aruba, This Adults Only paradise is exclusively for over 18 years old, is ideal for a fantastic and romantic vacation or adults that want a relaxing vacation without kids. This resort is the perfect place to relax, the Renova spa has a hair salon along with many treatments or massage options. For those who enjoy the sun, they have free lounge chairs, sun umbrellas and towels, both at the wonderful swimming pool and on the Palm Beach itself. Also, a complete entertainment program offers the possibility of trying out many different water activities: water sports such as windsurfing, snorkeling and kayaking, and even a diving test in the swimming pool. The evening brings live music, pool parties and shows or you can try the casino. The buffet restaurant invites you to enjoy the colorful Caribbean cuisine at lunch and dinner. At the same time, you will find different world flavors in the 4 thematic restaurants: Krystal” Fusion restaurant, “Rimini” Italian restaurant, “Malmok” Steakhouse, Mexican restaurant, Romantic dinner on the beach (additional charge). You If you do not feel like leaving your room you have free 24 room service. There is an ice cream parlor, patisserie and a 24 hour snack bar along with 3 bars, the swim-up bar is the perfect place to get the beverage of choice and meet new people or reconnect with old friends. The hotel has various room categories for you to choose from within the 482 rooms. All categories have free Wi-Fi, mini-bar, liquor dispenser, safe and balcony.